Summary: Earth, Fire, Air, Water – they have more power than you dream. The storm is coming . .
My Thoughts: Storm is one of those books you see in the bookstore, you pick up and read the summary, and you aren’t sure its the book for you, so you put it down. And than you see it again, and you decide to give it a try and end up really enjoying it. 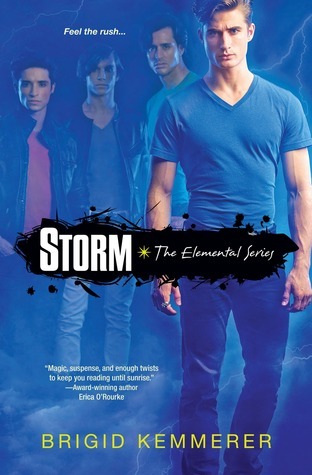 Storm was such a good book! I didn’t go into it with high hopes but I found myself really into the story and enjoying myself. We are introduced to the Merrick brothers and Becca who goes to school with a few of them. One brother, Chris is even in her class. She’s never really given him a second look until one day in the school parking lot where he’s getting a good beating. She swoops in and saves his life. And that is where it all starts. Becca has a bit of a past; a lot of rumors have spread about her and all the boys think she is easy. Of course, there is a new guy at school named Hunter who also comes into the mix. We don’t really know much about Hunter at first. He is such a sweetheart though. Chris and Becca get partnered up on a class project; they are forced to see each other more, even when things become awkward. As she learns more and more about the brothers and how each is an elemental, Becca’s life sure does take a turn and get confusing. The elementals are a group of people who have higher connections to the Elements. They can feel things other people can’t, and do things as well. Oh my gosh, this story was pretty incredible. You learn all about the elements and what each brother can do. You also watch as they are hunted down to be killed. There was some history splashed throughout the story so we understand why people want them dead and what their past is like. Storm had a few twists that I enjoyed. And the love triangle, yummy. I don’t know if I would even call it a love triangle, just a girl who likes two different boys. I’ve seen some pretty intense love triangles and this one just felt more sweet to me than others have. Storm really went beyond my expectations. I wasn’t expecting to like it as much as I did. Becca is a strong character and we really see how much she changes and how she realizes her inner strength. And hot boys is always a plus too. Overall: Wow, this is a book you need to read this year. It surprised the heck out of me and I can’t wait to read the next book in the series. The good news? We don't have to wait a year to read it. Fights, romance, betrayal, death, hot guys, what more can you really ask for in a book? Cover: Like it! I like how we get a sense on what the brothers look like. Now I want to know which one is which. I actually did pick this one up then put it back down. But after all of these amazing reviews, I really want to read it! Plus, 4 hot guys in one book? What more can you ask for!